The moon was just short of round; the tide inched higher. I trudged up from the beach, opened the door to Mbotyi Lodge, and was smacked by a wall of testosterone. Packs of hunky guys, juggling drinks and laptops, ricocheted between the bar and lounge. Invigorated by a day spent scuba-diving, they had videos to show, pictures to edit, tales to tell. Every tv in the lodge was tuned to an unfamiliar sport. I flitted among the guests, kind of jealous, catching snippets of shimmering silver on their laptop screens. My diving days were long past, and the Sardine Run is not for the rickety-limbed. From May to July in South Africa, when conditions are right, dense swarms of sardines migrate north along the coasts of the Eastern Cape and KwaZulu Natal, towards Mozambique. Its an oceanic picnic for predators. Undulating walls of fish are pierced from above by cape gannets and cormorants, and below by dolphins, sharks, and whales. What’s bad for the sardine is great for divers and videographers. Vast stretches of Eastern Cape beaches are wild and mostly empty, save for fishermen, scampering dogs, meandering livestock, surfers, and the occasional shipwreck. But during the Run, divers come from as far away as Russia and Australia to fill coastal resorts. The frenzy can also be seen above the waves, from chartered boats. My friend Nita, who manages Mbotyi, had arranged to have me fetched from Port St. John. 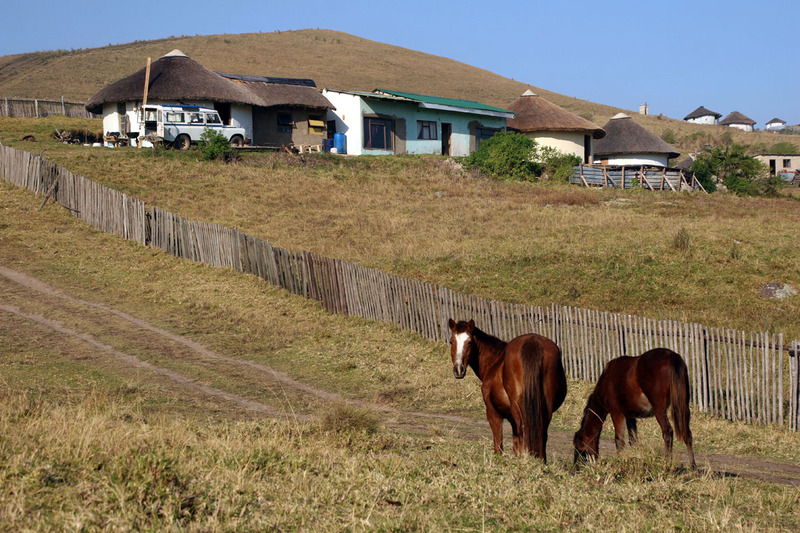 Relieved of driving, I could follow the sensuous sunlit curves of grazing land, dotted with Xhosa settlements. Mandela was a Xhosa; he’s never far from one’s thoughts here. 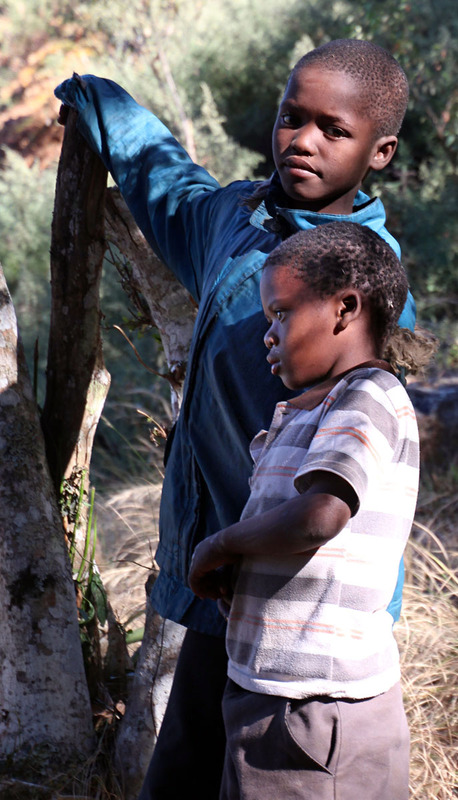 We sped past a procession of boys, enveloped in blankets, returning from a ritual circumcision. Trails of people and livestock hugged the road, and the flattened carcasses of unlucky dogs. When it darkened and our route devolved into a sort of riverbed, driver Gary’s fists reddened as he clenched the wheel, expertly navigating the last convoluted stretche to the lodge. Comfortably situated for the night, I woke shortly after sunrise and clambored down a short trail to the beach, where the Mbotyi (meaning Place of Beans) River meets the ocean. 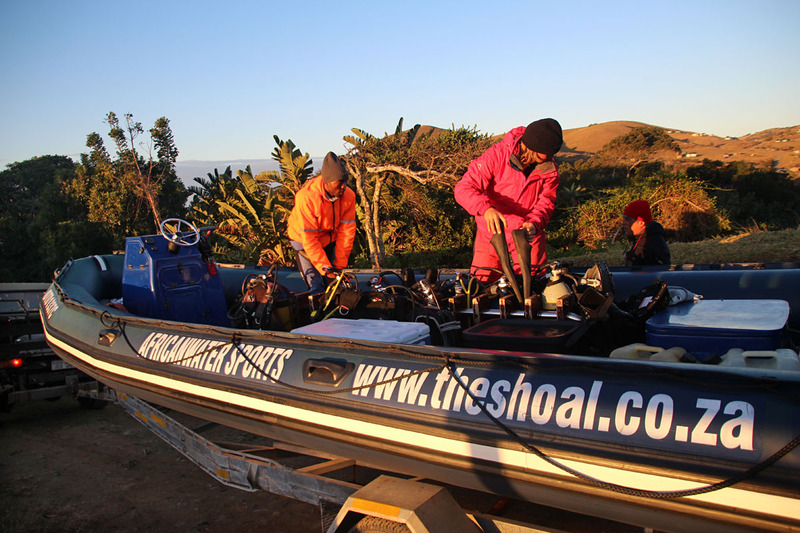 A small platoon of vehicles towing zodiacs had crossed the lagoon and assembled at surf’s edge. 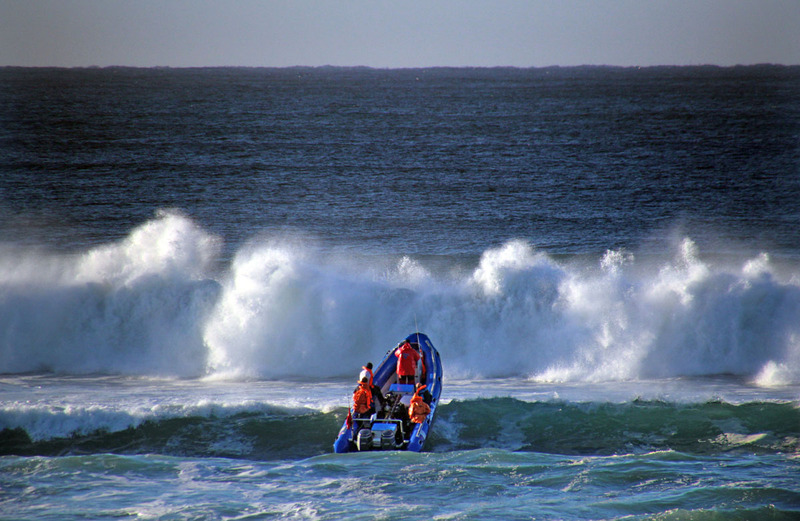 Crews of neoprene-clad divers, jostling cameras, swim fins and whatnot, sank into the inflatables and, in turn, literally hit the surf, bobbing vertically like a scary amusement park ride. Then, finding a flattened passage, they headed for deep water. As each boat became a dot on the horizon, I bemoaned my supreme wimpyness: cant drive, cant dive, what was I doing here? The answer was literally behind me, up the windwhipped slopes away from shore. While Nita was working, I would explore the neighborhood. a fierce cadre of yipping dachshunds ready to do battle. Farther along, thatched rondavels on steep hillsides anchored modest farm plots, and a display of wood carvings marked an artist’s place. Cowlicked cows traipsed along dirt pathways to their appointments. I surprised some horses grazing under wind-swept trees; they munched on unfazed. At a bubbling river tributary, two young barefoot boys in tattered clothes hopped willy- nilly over the slippery rocks, while I hesitated at its banks, worried about my shoes. Circling back through pods of dancing yellow flowers, I waved at a fellow in a flop-brimmed hat, hauling a truck engine down a steep ravine in a wheelbarrow. 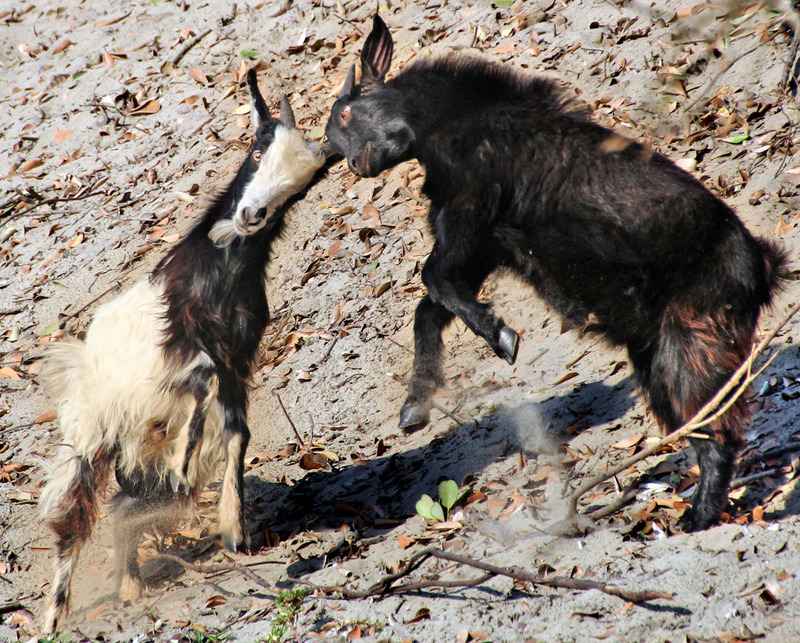 And there was this echo, this repeated clacking coming from downhill; two billy goats doing battle in the bush. 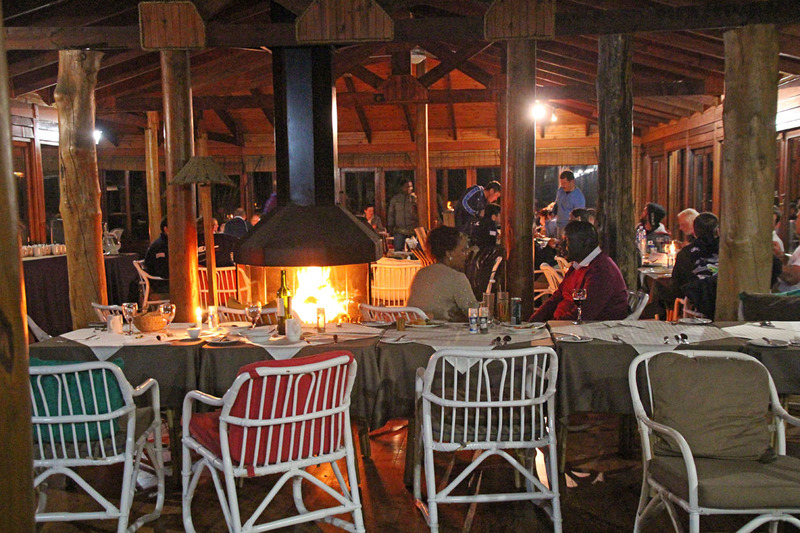 Back at Mbotyi, sparking fires and a glowing braai greeted returning divers and guests. The parking lot was gridlocked with still-dripping inflatables on trailers. With the Run in its last days, the testosterone meter would soon lower. Nita was occupied with a hospitality issue, and anxious about the whereabouts of Jamie, her dear canine companion. 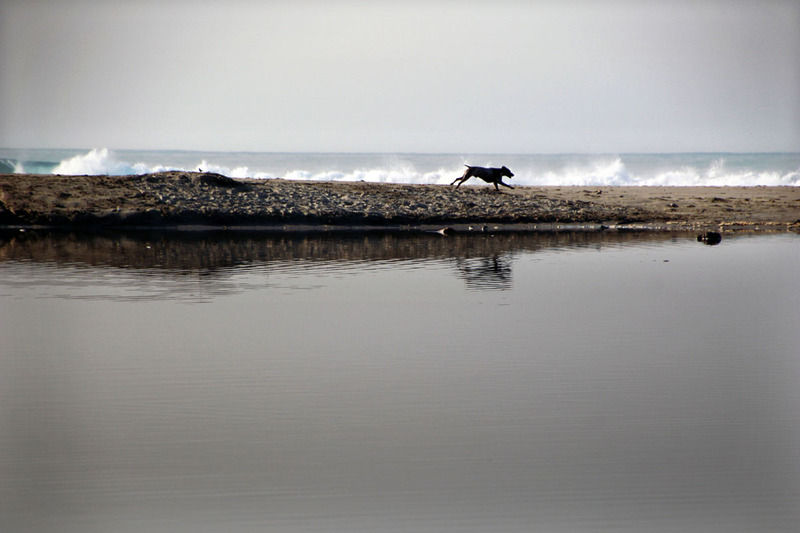 A rescue, Jamie now free-ranged over the beach and grounds, and could be back at the cottage. At last, with the bar bustling, sardine videos running, and diners accommodated, Nita and I met up. Balancing drinks and flashlights, we headed outside, under that just-shy-of-round moon, to search for Jamie. Tomorrow there would be time to visit Magwa Tea Plantation, and check out a potential airstrip. But where was that dog? Nita upped her pitch, and called again, but the surf was too loud.